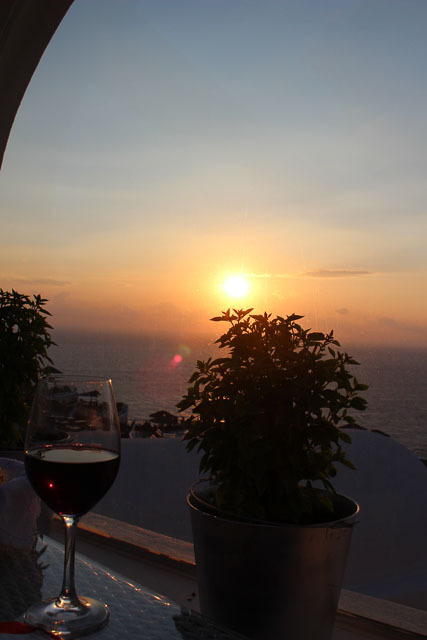 It's a little bit difficult to sum up the Santorini sunsets. They're a big deal on the island and as that golden hour approaches, the excitement and anticipation in the air is palpable. 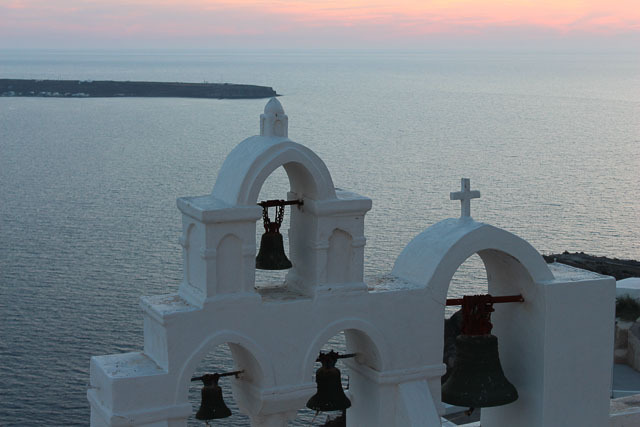 The cameras come out while visitors document the descent of the sun into the Aegean sea until it finally disappears into the horizon. 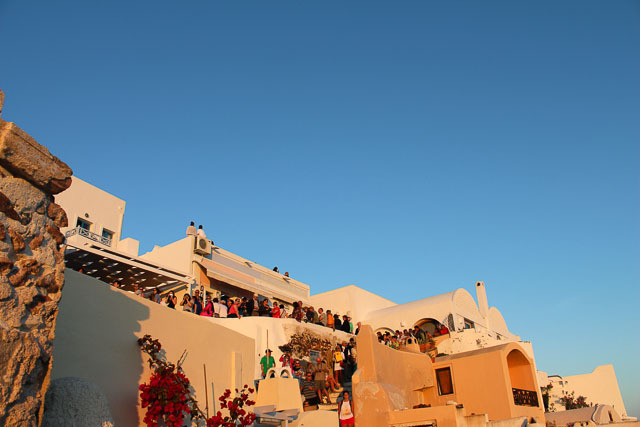 Oia has long been pegged the place to view one of the most beautiful sunsets in the world. Taking advantage of our rental car, we spent 2 nights in Oia. The first, we went armed with a list of recommended restaurants and the hope to stumble into one of them before the sun disappeared. We ended up with a great table and uninterrupted views and the sun set just as it was supposed to. It was nice but it didn't feel special. For me, the beauty of the sunset lies not just in the sun melting away for the night but within the colours it casts on everything else. 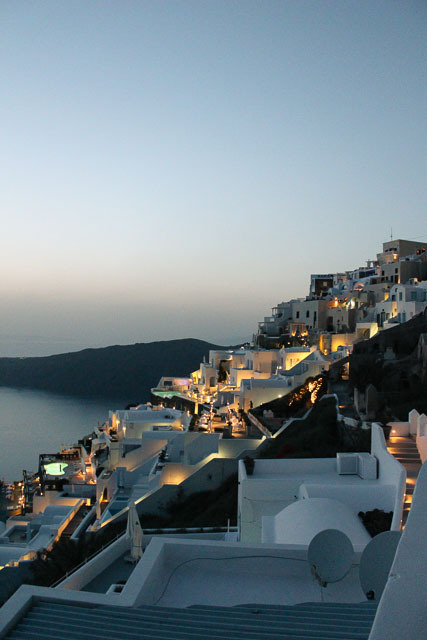 The second night in Oia, we found that beauty ... with plenty of others. Beautiful it was but it was also crowded. The small, cobblestone paths were lined with tourists, occasionally 3 or 4 deep. Photographers had tripods set up and everyone was searching and fighting for a spot to watch. It was pretty and I was fascinated by the changing colours cast over the white, concrete buildings but it was busy and while the anticipation of the crowd was something in itself, I preferred a quieter, more relaxed setting. 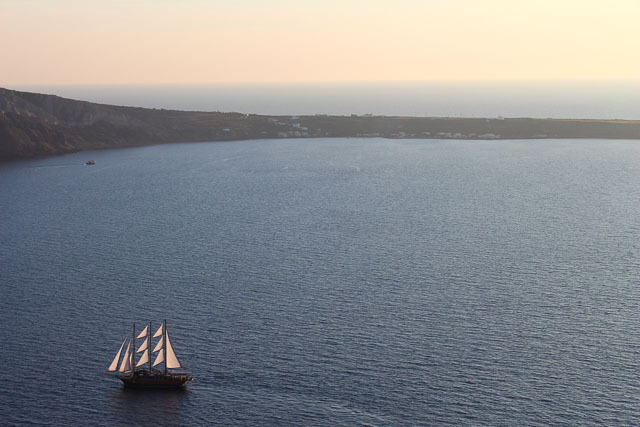 The rest of our Santorini sunsets were spent in Imerovigli. Occasionally we were out for dinner but more often than not, we were on our terrace pouring a glass of wine and stepping into the jacuzzi. It was peaceful and just the two of us. 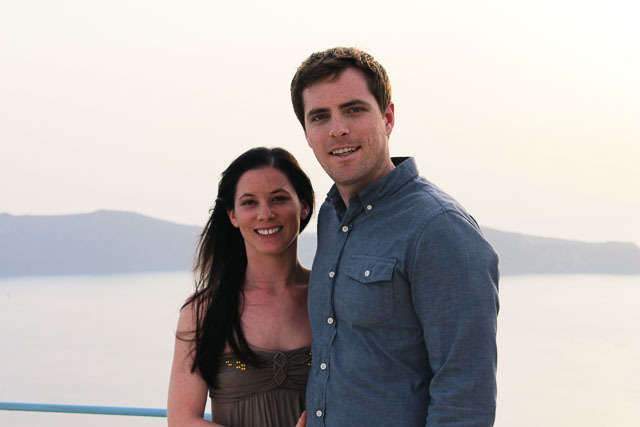 Love the photo of you two! So pretty! 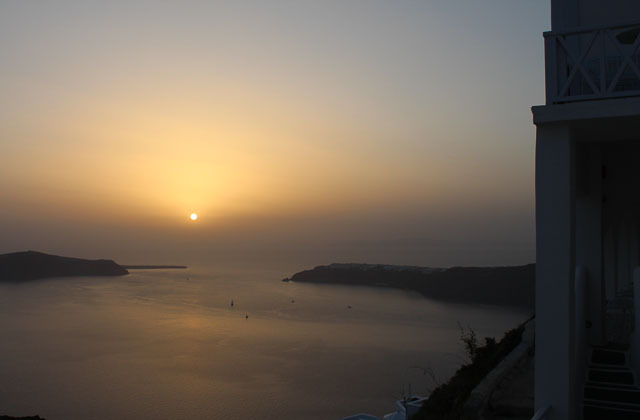 We did get to watch the gorgeous Santorini sunset during our short time there. As our ship was sailing away, we sat right on the top deck (in the appropriately named Sunset Bar) and sipped cocktails as the sun sank into the caldera. Not gonna lie, I got a little misty-eyed! I'd never witnessed a sunset so colorful. Funny thing is, it was cloudy almost the entire day we were on the island. It was like the Greek gods parted the clouds that evening just so we could see the famous sunset! Great photos, girl! these pictures are gorgeous! 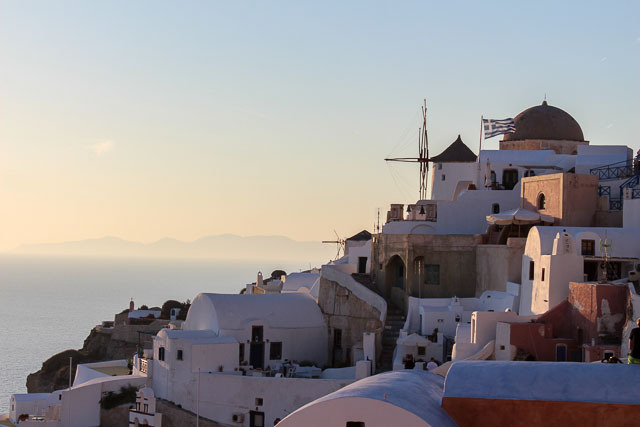 santorini is def on my list of places to go! That photo of you two is wonderful Jay! Beautiful sunsets... what do you think? Do they rival South Africa? Gorgeous photos Jay. 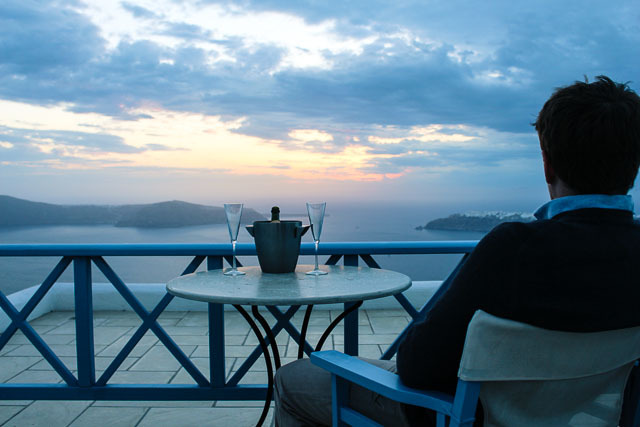 I too found Santorini sunsets somewhat spoiled by the throngs of people at Oia. 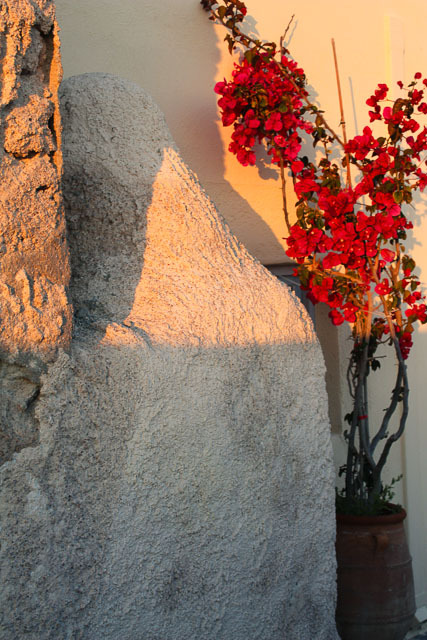 It looks as though you found the sunsets much more memorable at your gorgeous hotel. So pleased you had such a special trip. Oh wow, just wow! How incredible!!!!! 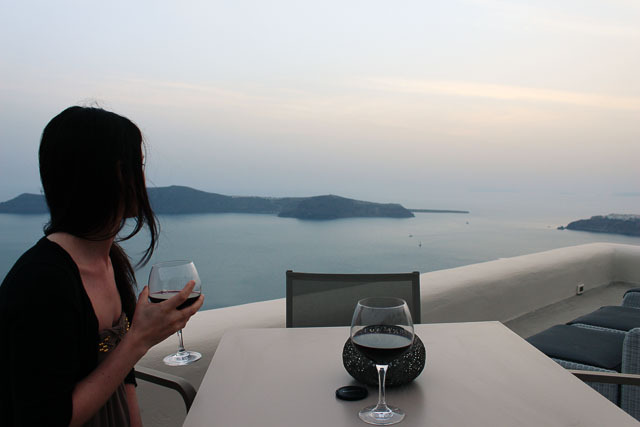 A Santorini sunset is definitely on my Bucket List. What gorgeous photos!!! 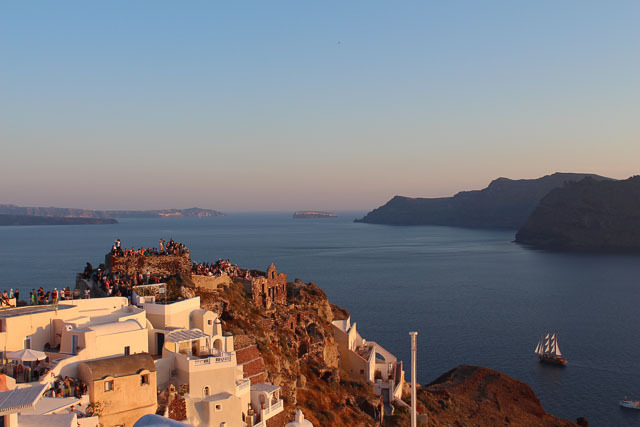 all of your Santorini talk makes me really want to go re-read Sisterhood of the Traveling Pants. :) I just keep thinking about Lena and Kostos and their families! Officially jealous! Santorini is definitely a dream of mine. what a breathtaking place! my favorite by far is that sailboat shot! absolutely stunning! Wow, the amount of people watching the sunset reminds me of watching the fireworks at New Year's... I can definitely see how watching the sunset from your terrace was a much more serene experience. Gorgeous! Would love to go! Ahhhh - I want to go back!! I DIE!!!!!!! These photos are incredible!!!! Wonderful shots! I have such intense wanderlust now! !